I really like to shoot the Springfield Armory® SAINT™ Rifles. The guns have such incredible versatility, are easy to shoot and have a wide array of applications; from competition and hunting, to self-defense, law enforcement and even military. My favorites by far are the popular sixteen-inch barreled SAINT™ rifles. I have shot these types of rifles in a lot of varied conditions and positions; getting in and out of cars, clearing small rooms, through small shooting ports, and around barriers, walls and barricades. What they are suggesting, of course, is that I try a Short-Barreled Rifle (SBR). According to the ATF.gov website and the Gun Control Act, Title 18, "The term ‘‘short-barreled rifle’’ means a rifle having one or more barrels less than sixteen (16) inches in length and any weapon made from a rifle (whether by alteration, modification, or otherwise) if such weapon, as modified, has an overall length of less than twenty-six (26) inches." Now, I put in a lot of practice time with my pistols and rifles, and I feel pretty good about my on-demand shooting performance, whether the barrel of my gun is 4.5 inches or 16 inches. But I must admit, I started thinking a lot more about getting an SBR. The idea of a shorter gun was intriguing to me because it offered many potential advantages. Because of the compact size, it should be much easier to wield and maneuver. As both an LE agent and a competitive shooter, I am exposed to and must operate with my firearms in a lot of tight spaces; spaces like vehicles, hallways, rooms, cover positions, windows and doorways. However, when I have tested the long vs. short-barreled gun theories in the past, by measuring accuracy and speed, my 16-inch rifle would almost always be victorious. One of the biggest issues for me, from a “shoot-abliltiy” standpoint, was my inability to control "other people's" SBRs. This stems largely from the extremely short handguards that are common on shorter rifles; most were seven inches, some even shorter. This created problems for me on a couple of levels. First, I couldn't get my support arm out toward the muzzle end of the rifle far enough. This really compromised my ability to control the end of the gun. I always felt like I was trying to use some kind of a poor pistol grip to control the rifle. A good grip is critical. Secondly, I wasn’t reliably able to use the handguard to support the rifle on any of the stabilizing objects (walls, cars, barricades, props, etc.). There simply was not enough handguard length to mount the rifle to anything and get into a really stable position. I would sometimes even see shooters rest the barrel on an object for stability, which creates an entirely separate issue. Not being able to stabilize the SBR is not a big deal for easy shots, but when the shots get hard, I need and want every bit of stability I can get. Lastly, it was a huge compromise to mount accessories on the handguard. As soon as I added a flashlight or sling attachment, most of my handguard became unusable by my support hand. There just wasn’t enough room. This, of course, also made it even more difficult to use any objects as support. What I really want is all of the flexibility and maneuverability of the shorter barrel, without giving up the stability and performance I demand with the longer rifle. Well, it's almost like Springfield Armory was listening and has introduced the SAINT™ SBR and the SAINT™ Edge SBR. 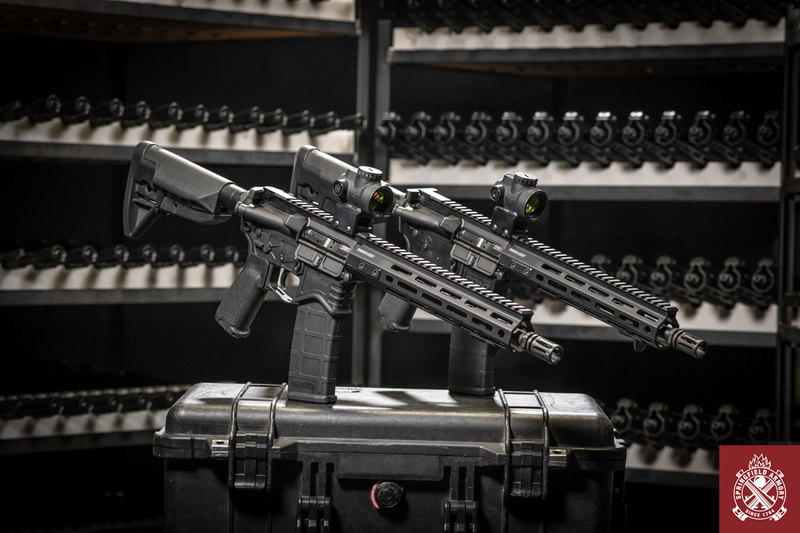 They basically took their very popular Springfield Armory® SAINT™ Rifle (with the free float handguard) and made it shorter and lighter, while keeping the stability and control of a longer rifle. What more could anyone want? There is plenty of room for my support hand (to control the rifle) and still attach a flashlight and a sling. Ultimately, the new Springfield SAINT™ SBRs provide the benefits of a shorter, more-compact firearm coupled with the control and stability of a longer rifle, all straight out of the box! It's obvious that Springfield cut no corners in the design and production. And once I decide which SAINT™ Short-Barreled Rifle I like better, it ‘s going straight to the top of my not-so-short gun wish list.